World Blood Donor Day is held on June 14 to raise awareness of the importance of giving blood. Making products such as clotting factors for people with haemophilia. Regular blood donations by healthy people are needed to make sure there is enough safe blood available at any given place or time. There is a constant need to donate because blood can only be stored for a limited time. There are around 112.5 million blood donations collected globally every year, with half of those coming from high-income countries that serve only 19% of the world’s population. About 65% of blood transfusions in low-income countries are given to children under the age of five. In contrast, 76% of all transfusions are given to those over 65 in high-income countries. Safety is a big issue. In 2013, 73%, or 122 out of 167 countries, had a national blood policy, and 65%, or 108 out of 167 countries, had specific legislation covering the safety and quality of blood transfusion. Myth: HIV or other infections can be contracted from donating blood. Fact: Donations are conducted in sterile conditions. A new needle is used for each donation and is then properly discarded. Myth: Giving blood is time consuming. Fact: The actual donation takes about 10 minutes, but the whole process should not take more than an hour or so overall and could save a life. Fact: It’s only a needle prick, and perhaps an ache in that spot for a short time after. Myth: The body has a limited supply of blood so it’s unhealthy to give some away. 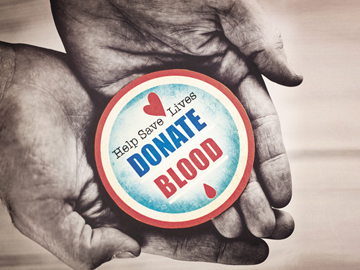 Fact: Only about 350-450ml of blood is taken, and the body makes new blood after donation. Myth: Older people should not donate. Fact: Anyone up to the age of 60 who is fit and healthy can give blood. Myth: Your health suffers after donating. Fact: If you are healthy before donating, you’ll be back on track in a day or two. Lost fluids can be replaced in a couple of hours if you drink enough, and you can resume exercise the next day. Myth: You cannot be a donor if you take medication. Fact: It depends on what medication you are taking. Check with the person in charge. Myth: Blood can be manufactured when more is needed. Fact: There is no substitute. Blood can only come from healthy human beings. Article taken from InHealth, Issue 15 2017. Click here to download the publication.